We are pleased to welcome Peter Warrack, Chief Compliance Officer, to our growing team. With over 30 years of experience in the detection and prevention of economic crime, Warrack is a recognised expert in major crime investigation and anti-money laundering. We are elated to welcome Peter aboard at this important juncture in Bitfinex’s journey and we look forward to all that lies ahead. 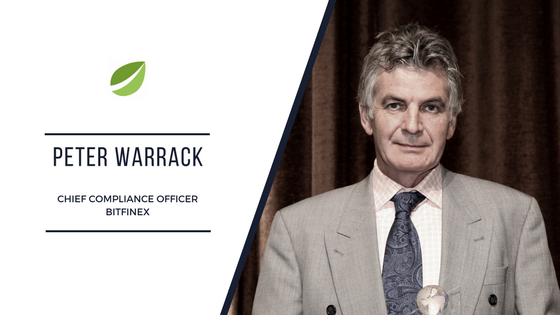 With a professional history in military intelligence, senior officer roles within the Police Service of Northern Ireland, and senior positions within the Royal Bank of Canada (RBC) and the Bank of Montreal’s Financial Intelligence Units, Warrack’s appointment as Bitfinex CCO is intended to furnish us with the expertise and experience required to ensure that we continue to meet all relevant regulatory compliance standards. “I am incredibly excited to be joining Bitfinex as CCO. As a longtime advocate of blockchain technology and the integration of token markets into the mainstream, I hope to be a valuable asset to Bitfinex moving forward.” said Warrack. Peter Warrack currently serves as an instructor and board member of the Canadian Institute for Financial Crime Analysis (CIFCA), Canada’s center for money laundering risk and financial intelligence, in connection with the Faculty of Business at Seneca College. Warrack joins Bitfinex as the former Director of AML (Fintech Advisory) and Compliance Officer at the Bank of Montreal. Join us on our mission to create the industry’s most innovative cryptocurrency trading platform.